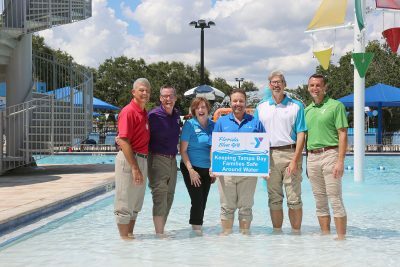 The Tampa Metropolitan YMCA has joined forces with several other regional YMCAs to accept a grant from Florida Blue to continue bringing basic water safety lessons to area youngsters free of charge. The next session, which takes place in September, is open for registration. From left, G. Scott Goyer, YMCA of the Suncoast President & CEO; David Jezek, YMCA of Greater St. Petersburg President & CEO; Laura Gilbert, Sarasota YMCA President & CEO; David Pizzo, Florida Blue Market President; Sean Allison, Manatee YMCA President & CEO; and Matt Mitchell, Tampa Metropolitan Area YMCA President & CEO. Most parents taking advantage of the Tampa Metropolitan YMCA’s free “Safety Around Water” program are not waiting. They are bringing in plenty of little ones to get lessons for them that could save their lives around water. The local program has teamed up with other YMCAs in the region to accept a $155,000 grant from the Florida Blue Foundation to keep the Safety Around Water program going through 2019. Kids 3 through 12 can take the course free of charge. The next session will take place beginning Sept. 4. Classes meet twice a week for three weeks. Sign-ups are available at all YMCA branches or by going to https://www.tampaymca.org/. The Tampa Bay Rays financed the program for 2018, and the Florida Blue Foundation is now picking it up, said Y spokeswoman Lalita Llerena. “You do not have to be a member of the Y to take advantage of this,” said Amanda Walker, aquatics director for the Tampa Y system. The program has served about 800 youngsters a week at the sessions this year. “It’s been a great summer,” Walker said. “For the Tampa association we offered three separate sessions, including during spring break, during national water safety month in May, and this third session is coming up in September. Each of the Y locations throughout Tampa Bay, beginning the Tuesday of Labor Day week, will offer lessons. If classes need to be added to accommodate more children, they will be added, she said. “We will take as many participants as we can,” Walker said. Sadly, Florida led the nation in drowning deaths of children ages 1 through 4 in 2017. During the 40-minute lessons, kids are taught to float on their backs with their faces out of the water, so they can remain calm until someone can reach them. The “Jump, Push, Turn, Grab” course is pool-related, with little ones learning that if they jump in over their head they should push back up to the surface and take a breath, then turn and grab for the wall. For even more information on drowning prevention, visit the state site at www.watersmartfl.com and learn what steps to take to secure a pool and protect children by reducing childhood drowning and increasing pool safety. Other participating YMCA associations include YMCA of the Suncoast, YMCA of Greater St. Petersburg, Manatee YMCA and Sarasota YMCA.